Not pictured: Air Food One meal. Air Food One joins Keeping up with the Kardashians and Justin Bieber as proof that there is always a market for things aimed at people with questionable taste. CNN’s Barry Neild reports Allyouneed.com and LSG Sky Chefs teamed up to meet a demand for in-flight food service at home. Yes, there is a demand for airline food outside of the one place where it’s nearly the only food around, namely 35,000 feet in the air. According to the report, there are those in Dusseldorf and Cologne (Germany) who can now order airline meals online and have them delivered to their homes, where they can enjoy meals we presume they were dared to consume. To that end, folks can order at the company’s website. The current menu, translated by Google, features a regular and vegetarian option. The “full fare” item for the week is corn-fed chicken with mushroom vegetables. Vegetarians can enjoy cannelloni with ricotta. So far there isn’t any word if these are served in those special plastic wraps that somehow keep airline food steamed and dry at the same time. Snark aside, the meals are essentially an answer to those parents who just don’t have the time to cook. Let’s play spot the oxymoron in the previous statement. 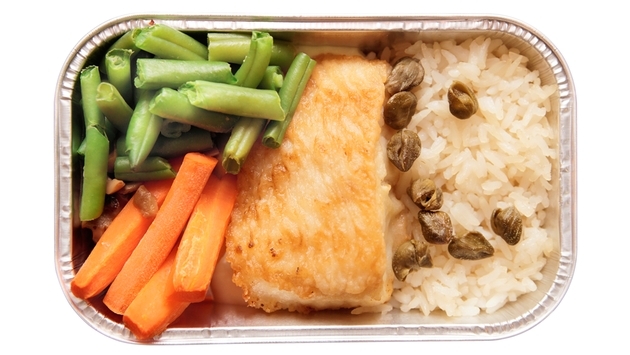 Now ordering airline food at about $13 a pop sounds certifiably insane. However, the food from Air Food One is reportedly more delicious than its airborne relative. Now most of us are astonished that outside the confines of a plane’s cabin one would actually want in-flight fare—especially when you consider eating gravel from the floor would be a cheap alternative. This is the same kind of food that has launched countless stand-up routines. Yet there are those who click order with a straight face, eagerly anticipating a shipment of in-flight food to sate their respective hunger. For the remainder of sane eaters around the world, airline food will be left to those rare moments when eating a depressing, gray chicken breast with glop is slightly better than starvation at 35,000 feet.